Fully cooked bacon is ready to eat after easy prepping and some baking time. 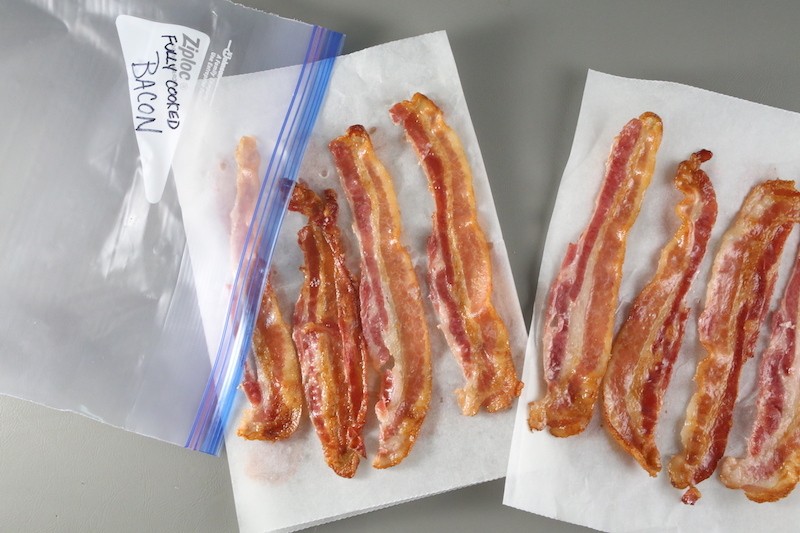 After making a batch of Pre-Cooked Bacon strips you can store, freeze or use up afterwards. This method can be a tremendous time savor for future meals that consist of bacon in them. It’s done by placing all these fatty strips onto a baking pan and allowing the oven to do the cooking. Now, if you’re planning to freeze or store the bacon afterwards then slightly under cook the bacon by a few minutes to allow them to further cook during the heating up time. Anywhere from about 20-25 minutes is a good time frame to go by for that “under cooked” but almost done stage. 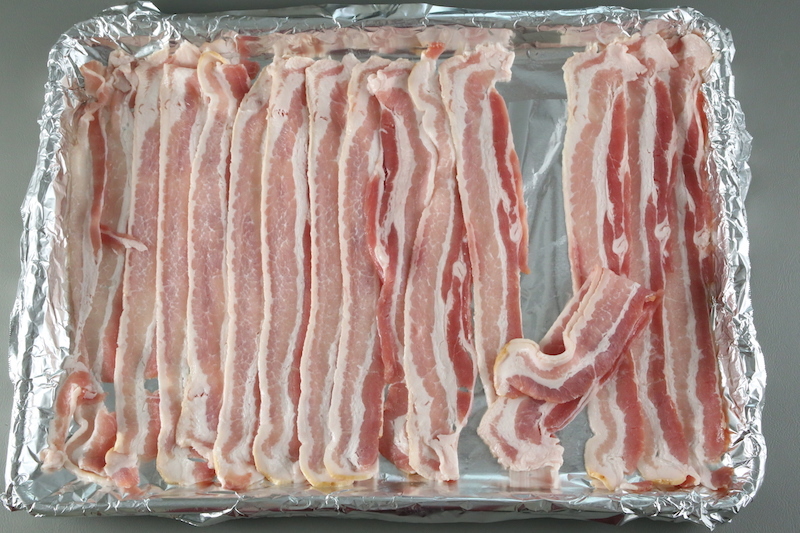 To make them fit in one pan overlap the bacon only do separate the strips right after baking otherwise they can stick. Clean up is easy and you can have ready on hand bacon. Try this method the next time you make bacon. 1. Preheat the oven to 400 degrees F. Line a large baking sheet with aluminum foil. 2. 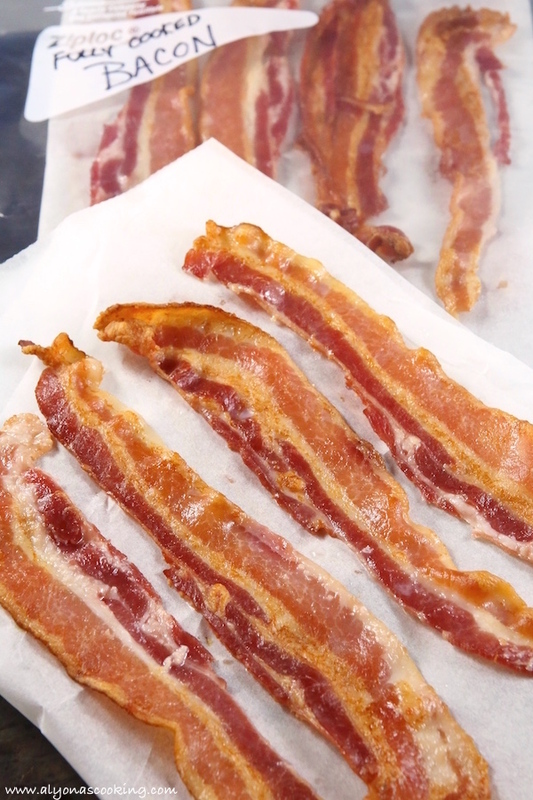 Place bacon strips on the pan overlapping each other and bake in the pre-heated oven for 20-25 minutes. 3. Quickly separate bacon strips while still hot (using a utensil) to prevent the bacon from sticking. 4. 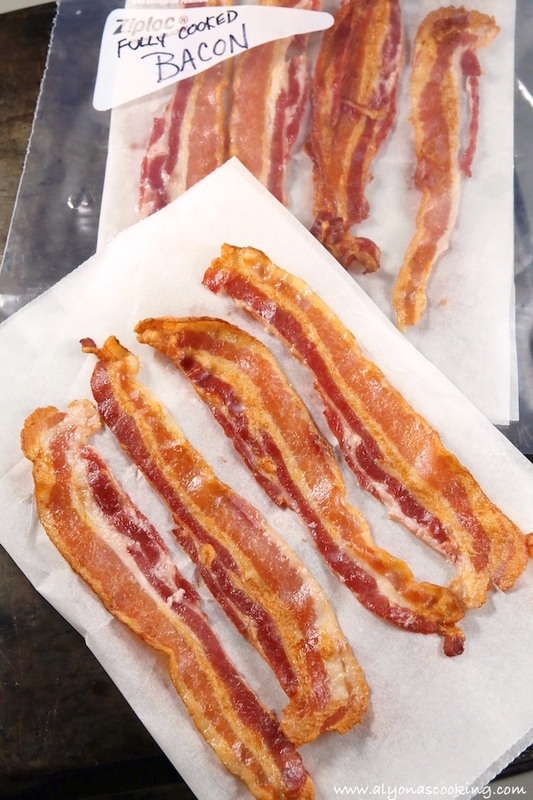 Fold a 15 by 10-inch sheet of wax paper in half and stack about 4 bacon strips onto each paper layer. Place into a zip-loc bag and freeze. 5. To re-heat frozen bacon place in the microwave for 30 seconds. Tip: You may also store cooked bacon in the refrigerator until needed, I only advise to do so for up-to a few days then freeze if needed. 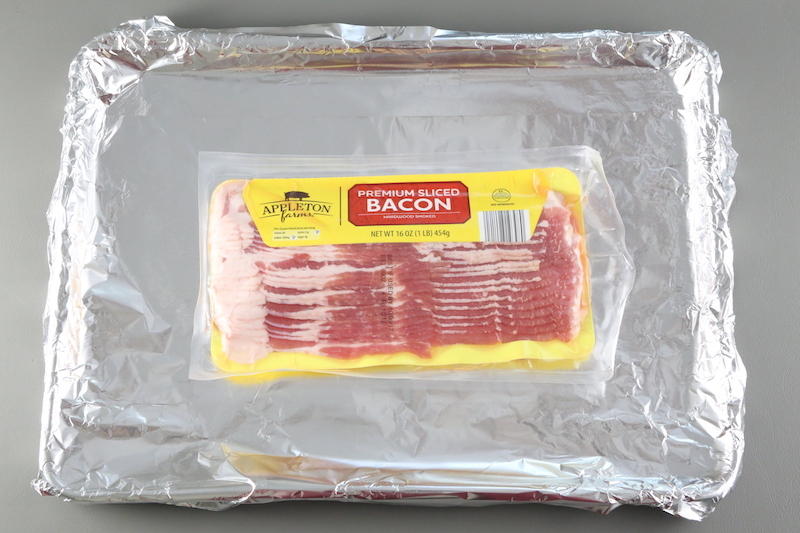 Preheat the oven to 400 degrees F. Line a large baking sheet with aluminum foil. 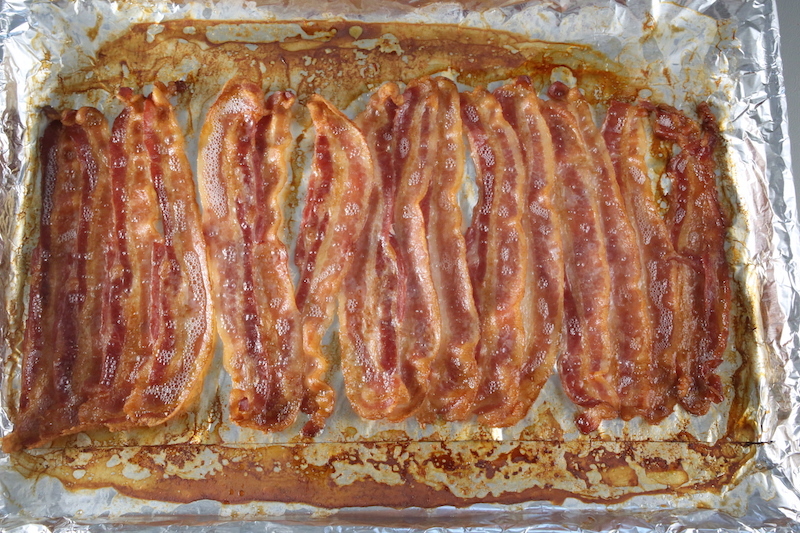 Place bacon strips on the pan overlapping each other and bake in the pre-heated oven for 20-25 minutes. Quickly separate bacon strips while still hot (using a utensil) to prevent the bacon from sticking. 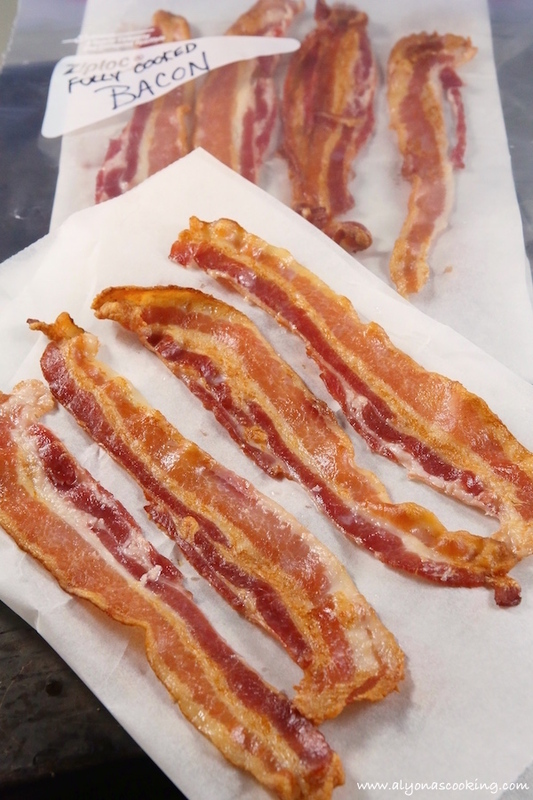 Fold a 15 by 10-inch sheet of wax paper in half and stack about 4 bacon strips onto each paper layer. Place into a zip-loc bag and freeze. To re-heat frozen bacon place in the microwave for 30 seconds. 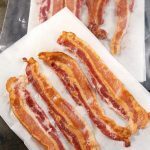 Tip: You may also store bacon in the refrigerator until needed, I only advise to do so for up-to a few days then freeze if needed. I’m going to do this today.